Well...Valentines Day is coming very soon. Here with my Maple character Harry9007 with 3 freshly hunted Valentine Roses (its a pole arm rose-shaped weapon), I wish those who're reading my blog a VERY HAPPY VALENTINES DAY. 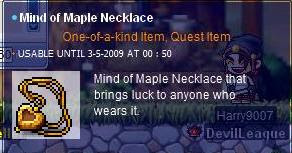 By the way, I just completed the Maple Necklace quest and I felt so happy, since I'm getting my first necklace armor for my character. 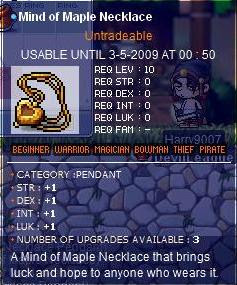 And below is the quest item gained after completing the task given and the stat of the necklace. What Have We Done In Our Sem 2 TE 4 ! ?